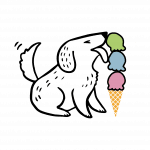 What is an Ice Cream Trail? The Ice Cream Trail is a trail featuring 14 unique ice cream shops in the Tri-Valley. These shops offer unique styles of this delectable frozen treat, so rather than make you decide which is best, we want you to try ‘em all. To encourage equal opportunity scooping, Visit Tri-Valley is rewarding real ice cream fanatics with their own stylish VTV ice cream scooper when you visit five stops on the Tri-Valley Ice Cream Trail. We think the ice cream is its own reward, but prizes are always fun. Download an ice cream passport. You can post pictures of your five different creations and tag #trivalleyscoop on Facebook or Instagram. Email info@visittrivalley with a snapshot of your completed passport of 5 stops and your address. We’ll send you a Tri-Valley Ice Cream Scoop!